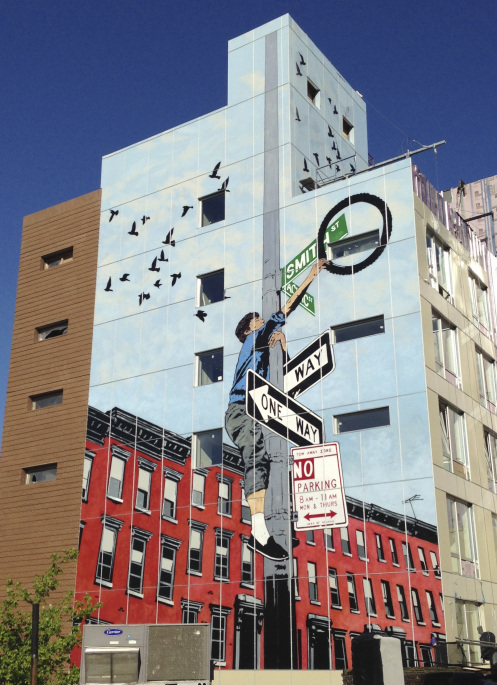 Sign Language, the 45-by-80 foot image of a boy reaching for a bicycle wheel–and the sky–stretches across the facade of a new residential structure at 267 Pacific Street in the Boerum Hill section of Brooklyn. 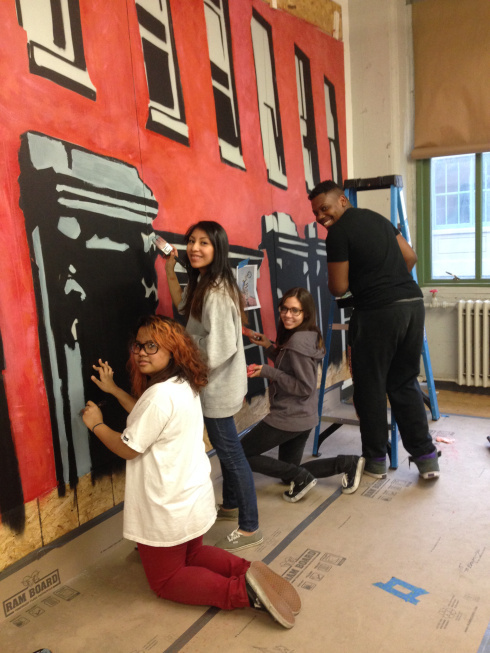 The mural is the production of Cre8tive YouTH*ink, the creative-arts youth-development nonprofit run by Jerry Otero (aka Mista Oh), in collaboration with the Quinlan Development Group and Lonicera Partners. The project, “The Art School Without Walls, Vol. 6,” featuring street artists Chris Stain and Billy Mode, provided creative arts mentorship to 15 inner-city youths (ages 15–22) in a two-month-long mural workshop. Production took place at the group’s temporary headquarters, a large studio in the Industry City Complex located in Sunset Park, Brooklyn. There, Stain and Mode engaged the 15 apprentices in all aspects of mural-making to produce Sign Language, which was inspired by a photo by the legendary Martha Cooper. 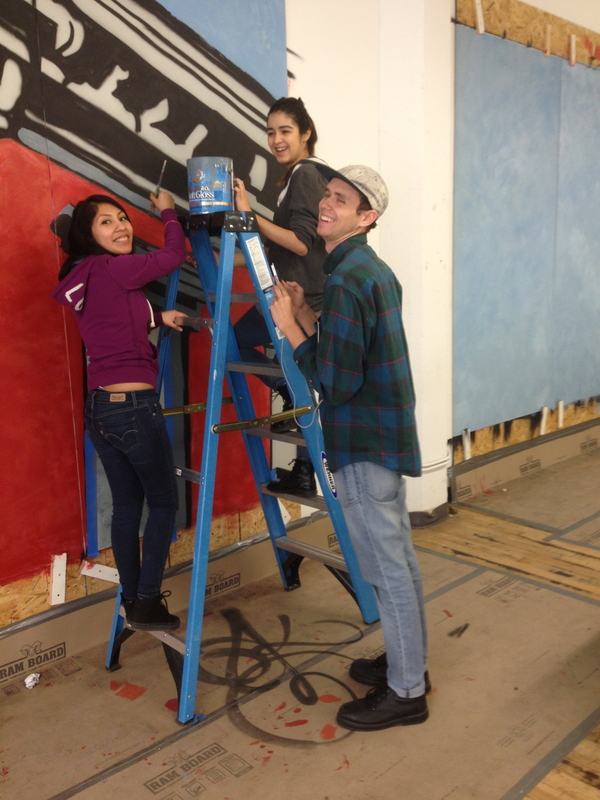 Above, visual-arts apprentices Virginia Sanchez, Cynthia Martinez, Lalita Santos, and Vince Maximin. The posts include profiles by social-media apprentice Nicole Casamento with every one of visual-arts apprentices in Art School Without Walls, Vol. 6. (Left, Nicole on the job interviewing Lalita Santos.) Also check out Nicole’s extensive and revealing interview with Martha Cooper. 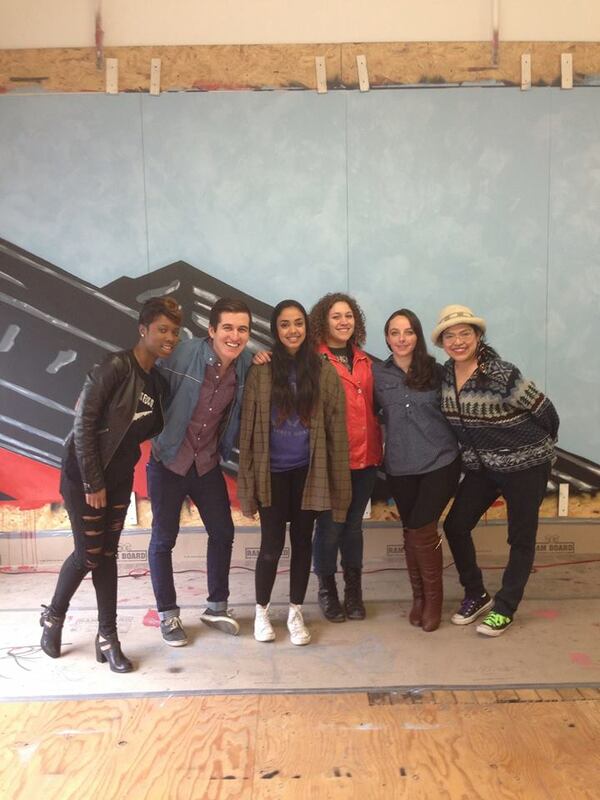 Below, social-media apprentice Monique Campbell with Niborista crew Max Duron, Naiky Paradis, Alicia Prieto, Nicole Casamento, and Eva Mayha Davis. Watch Mista Oh’s stunning video of the making of the mural. Read more about the project at Cre8tive YouTH*ink and here on Niborama.com. This is a great example of public art in the city. I will be including more art in the community as my blog develops.